Alloys are metallic compounds composed of one metal and one or more metal or non-metal element. Individual pure metals may possess useful properties such as good electrical conductivity, high strength, and hardness, or heat and corrosion resistance. Commercial metal alloys attempt to combine these beneficial properties in order to create metals more useful for particular applications than any of their component elements. Steel, for example, requires the right combination of carbon and iron (about 99% iron and 1% carbon, as it turns out) in order to produce a metal stronger, lighter and more workable metal than pure iron. Precise properties of new alloys are difficult to calculate because elements do not just combine to become a sum of parts; rather, they form through chemical interactions which depend upon component parts and specific production methods. As a result, much testing is required in the development of new metal alloys. Melting temperature is a key factor in alloying metals. Galinstan®, a low-melt alloy containing gallium, tin, and indium, is liquid at temperatures above 2.2°F (-19°C), meaning that its melting point is 122°F (50°C) lower than pure gallium and more than 212°F (100°C) below indium and tin. Galinstan® and Wood's Metal are examples of eutectic alloys -- alloys having the lowest melting point of any alloy combination containing the same elements. Thousands of alloy compositions are in regular production with new compositions being developed every year. Accepted standard compositions include the purity levels of constituent elements (based on weight content). The makeup, as well as mechanical and physical properties of common alloys, are standardized by international organizations such ISO, SAE International, and ASTM International. Some metal alloys are naturally occurring and require little processing to be converted into industrial grade materials. Ferro-alloys such as Ferro-chromium and Ferro-silicon, for instance, are produced by smelting mixed ores and are used in the production of various steels. 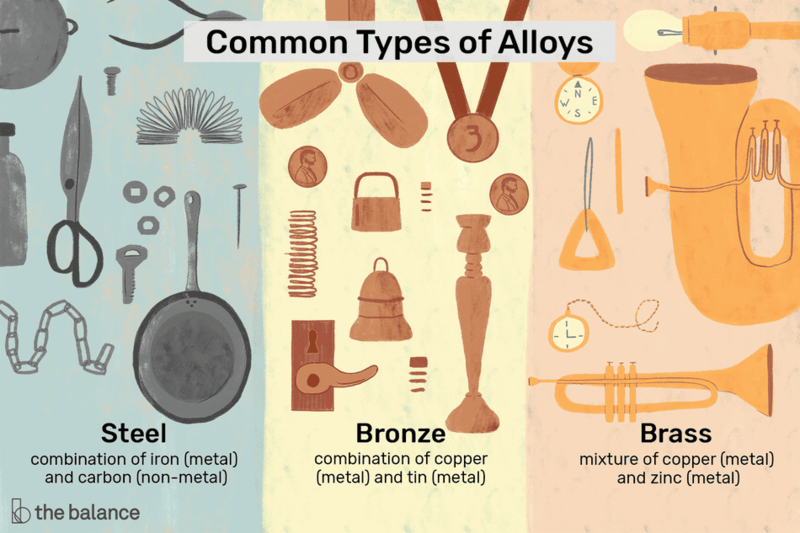 Yet, one would be mistaken to think that alloying metals is a simple process. For example, if one were to simply mix molten aluminum with molten lead, they'd find that the two would separate into layers, much like oil and water. Commercial and trade alloys generally require greater processing and are most often formed by mixing molten metals in a controlled environment. The procedure for combining molten metals or mixing metals with nonmetals varies greatly depending on the properties of the elements being used. Because metal elements possess great variances in their tolerance of heat and gasses, factors such as melting temperatures of component metals, impurity levels, mixing environment and alloying procedure are central considerations for a successful alloy process. While elements like the refractory metals are stable at high temperatures, others begin to interact with their environment, which can affect purity levels and, ultimately, the alloy quality. Often in such cases, intermediate alloys must be prepared in order to persuade elements to combine. As an example, an alloy of 95.5 percent aluminum and 4.5 percent copper is made by first preparing a 50% mixture of the two elements. This mixture has a lower melting point than either pure aluminum or pure copper and acts as a "hardener alloy." This is then introduced to molten aluminum at a rate that creates the right alloy mix. Sources: Street, Arthur. & Alexander, W. O. 1944. Metals in the Service of Man. 11th Edition (1998).